Escoveitch Fish (or Escovitch) is a typical Jamaican dish, packed with bold flavors. Typically red snapper is used but one can use any white fish. Porgies or croakers work just fine and they are both cheaper than red snapper. I like going to stores where I can find fresh fish and have store associates scale and gut the fish for me. Using a knife, make 2 incisions on either side of each fish. 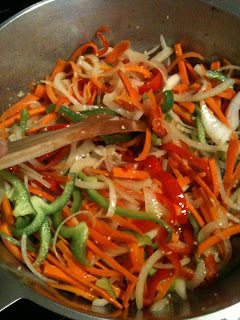 In another pan, heat oil then saute garlic, onions, peppers, carrots for about 3 minutes. Add scotch bonnet peppers, vinegar, water, salt, pepper and brown sugar. Cook until liquid had reduced and onion are soft. I actually had this dish last night. My Jamician neighbor cooked some for a party he was having and he had me come over to get a plate. I love this recipe with Red Snapper. Adobo is an all purpose seasoning from Goya. You''l find it in most grocery store in the hispanic or ethnic food aisle. I usually use Adobo con pimiento, it the one with the red cap. 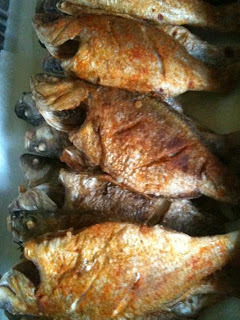 flour on fried escovich fish never heard of it. i don't like your recipe you need to go back to the drawing board or ask a real jamaican. Thank you for your comment. Dusting with flour before frying for this dish is actually not unheard off. I have done it with and without flour, however I prefer the look of the fish when flour is used. As much as I place significant importance on flavor, aesthetic appeal of food is at the top of my list as well. I have prepared this dish for a number of people including "real" Jamaicans; All reviews have been positive and I am very satisfied with the finished product. Again, thank you for your input and do continue to visit Cooking with Val! 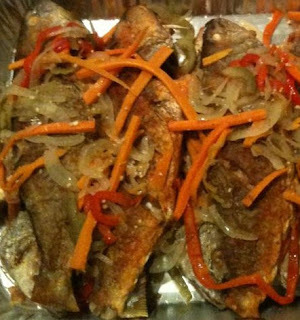 I have seen granny and auntie fry this dish, and yep, we are jamaicans, and I have to say I have never seen that sugar is added to the final dish. How come? Sugar is only used to regulate the tartness from the vinegar. It's a small amount and it's not used to make the dish sweet. Those julienned veggies look so good!